Remember that beautiful wedding you attended last summer? Or the charity dinner when you ate the best steak of your life? Or that cocktail reception where you were served a glass of wine before you even asked for one? We are the people behind the scenes of those events and we love providing you, the guests, with excellent service! We also recognize that while we have been in your shoes, you may or may not have been in ours, and with the holiday season starting, we wanted to shed light on a few things to help make your event run as smoothly and safely as possible. 1) The coat check is your best friend. Check your coat, purses, bags, umbrellas, etc. when you first arrive to the event. Our friendly coat check attendants will ensure your items are stored safely all night AND there is no risk of us tripping on personal items that you may store under your chair during dinner service. We’d hate to trip and risk spilling hot soup on your or your table guests. This would be mortifying for both us and you. 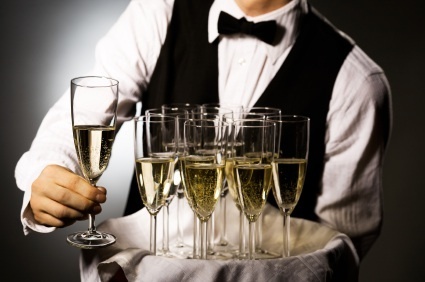 2) Ask who your wine steward is – they will be able to help get you that cocktail while your wait staff are busy serving the food. We know, we make it look easy but…a well-executed dinner service is like a well-oiled machine. There are many moving parts and timing is everything. Food service is timed perfectly with the kitchen to make sure food looks good and stays hot. We are more than happy to get you another gin and tonic, but if you see us running around with hot plates in our hands, ask your wine steward and they will gladly help you. Once we have finished serving your meal we’ll come around and make sure your cocktail glasses are filled! 3) We can easily provide a chef or chef assist for your event. Most servers and bartenders love food and may even cook for themselves, but are not trained chefs. We do a lot of home events and small dinner parties at the Butler, and our head waiters are happy to do some light food prep (ie, warm the hors d’oeuvres and put them on a tray), but if you were expecting Gordon Ramsay to come over and cook and carve your turkey at your Christmas dinner, it’s best to specify that beforehand. If you do need staff with more kitchen experience let us know. We have an amazing Culinary Team to help with all of your cooking needs…and our chefs won’t have your guests cowering in the corner a la Hell’s Kitchen, unless you’re into that sort of thing. 4) We are great at multi-tasking and will happily serve you food, beverages, and clean up after you, but please don’t be offended if it takes us a few minutes to get you that delicious spring roll, AND clear your empty glass, AND clear your cocktail napkin. We are working on growing extra hands so that we can do it all at the same time but until we figure that out we may have to get one of our amazing co-workers to assist you. 5) We want you to have an amazing time at your event but part of our job is to watch our for your safety. All of our staff is certified by Smart Serve Ontario, which means we take your safety into the highest consideration when serving alcohol. As we enter the time of open bars and holiday parties, please relax, have a few, Shake It Off Taylor-Swift-style, but please be sure to drink responsibly. No one wants to be “that person,” so please know your limits and get home safely.